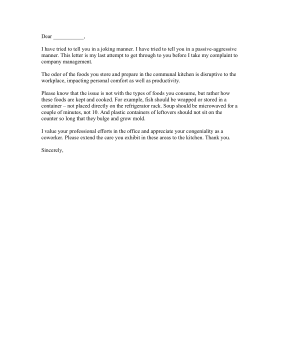 Perfect for the workplace, this complaint letter is addressed to a coworker who has been stinking up the common space. I have tried to tell you in a joking manner. I have tried to tell you in a passive-aggressive manner. This letter is my last attempt to get through to you before I take my complaint to company management. The odor of the foods you store and prepare in the communal kitchen is disruptive to the workplace, impacting personal comfort as well as productivity. Please know that the issue is not with the types of foods you consume, but rather how these foods are kept and cooked. For example, fish should be wrapped or stored in a container - not placed directly on the refrigerator rack. Soup should be microwaved for a couple of minutes, not 10. And plastic containers of leftovers should not sit on the counter so long that they bulge and grow mold. I value your professional efforts in the office and appreciate your congeniality as a coworker. Please extend the care you exhibit in these areas to the kitchen. Thank you.